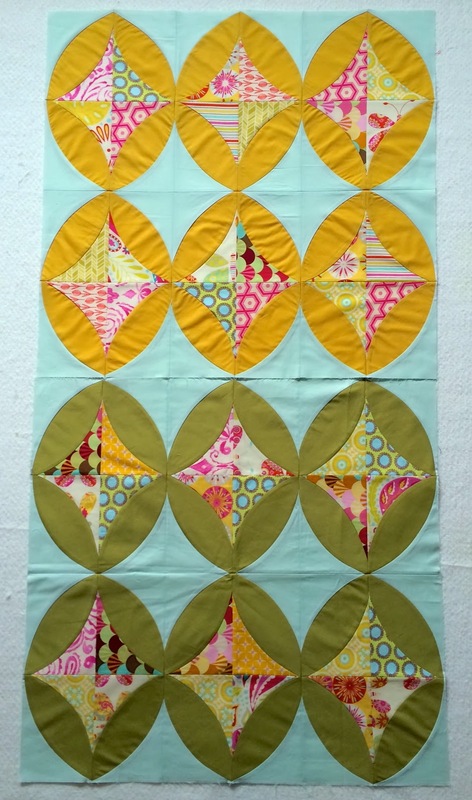 I'm a couple of days late for checking in on the Mod Olives QAL. We were out of town for a Trunk Show and Demo and just got back Saturday night. Here's my next set of Mod Olives. All my Mod Olives so far. For those participating in the QAL, you are to do 4 blocks a week. 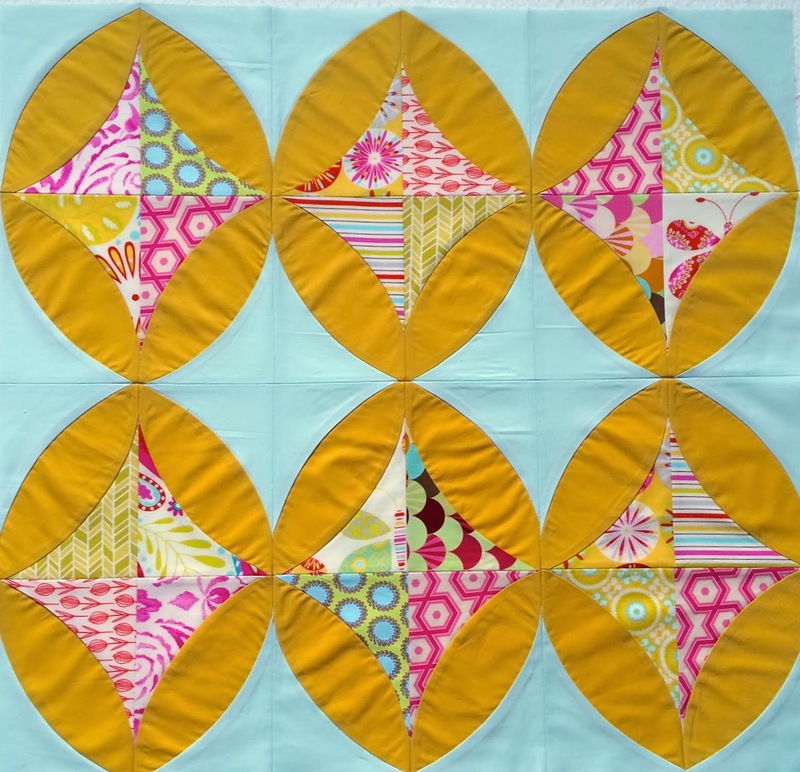 I've found it's just as easy to do 6 and that way I can sew my color groupings together. Her layout is going to be different than my layout. She's going to do four columns rather than four groupings. I'm anxious to see how that looks! 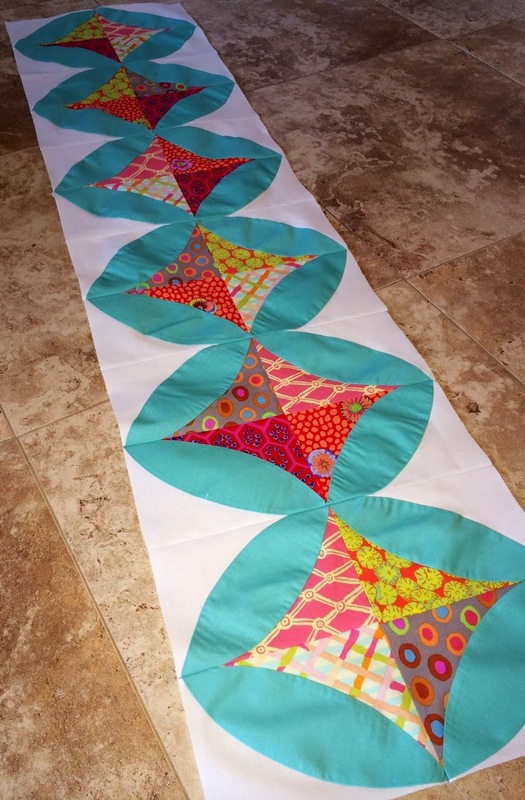 I'm a week ahead of you all in hopes that I can start quilting my top for those of you wanting some quilting ideas for your own Mod Olives quilt. I also wanted to point out a couple of things for these blocks. If you notice the picture above, my yellow olives have more ripples than my green olives. Both solids are from different fabric companies. The yellow solid seemed to have more stretch which created some ripples. It's hard to know what fabrics will do this and what fabrics won't. These ripples will disappear once I start quilting my quilt. It is very common to have ripples when sewing with curves and again a lot of it depends on the fabric you are using. If it really bothers you, you can spray starch your fabric before cutting to help give it more sizing and stability. Another thing I wanted to point is the inconsistencies you may have when sewing curves. I've sewed tons of curves and even I will have some points not come together perfectly. Can you see how my center seams don't come together in the picture above. I didn't pay close attention when sewing these two blocks together. If I had noticed before hand I could have used pins to help match the seams up. Am I going to resew this? NO! I'm going to leave it alone. When I'm all done piecing and quilting my top, you won't even notice it. Please don't hesitate to email pictures of your blocks or blocks in progress if you are having problems putting your blocks together and we will try to help you out. Most of all just have fun! There are some fantastic Mod Olives blocks over on the Flickr Group and remember to add your own Mod Olives blocks so we can see them too!